Beach Hut Deli, a franchise new to the Las Vega area, is kind of like Port of Subs did a bunch of steroids then smoked a huge joint. The sandwiches are gigantic, and while a huge sandwich is not inherently problematic, they are cramming way too much stuff onboard rather bland, dry hoagie rolls. Restraint is important when you're making food for people to eat, especially when you're trying to make exciting food that people will talk about and blog about and take Instagram pictures of and be hungry and come back for more. Be creative, try some wild combinations, but draw the line the somewhere or else you're gonna drop a monstrosity in which PASTRAMI AND CREAM CHEESE ARE ON THE SAME SANDWICH. (Capital letters indicate sandwich blasphemy, in case you hadn't noticed.) So this thing, the Santa Cruz, has those two unhappy partners, plus avocado, bacon, mayo, mustard, pickles, tomatoes, red onion, lettuce, peppers and more cheese, melted. I think it was provolone. I don't know. How can you keep track? Look at this photo: ridiculous. 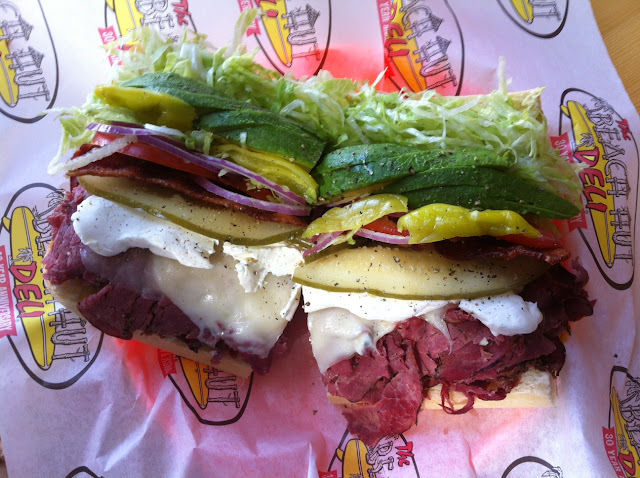 Now look at it and imagine it without the pastrami—which, by the way, was decent and there was a lot of it—melted cheese or pickles. All of a sudden you've got a killer BLT, no? I know there are those of you who see a sandwich like this and get excited. Keep it coming, you'll say. No, friend, that is not the way. Restraint is important.